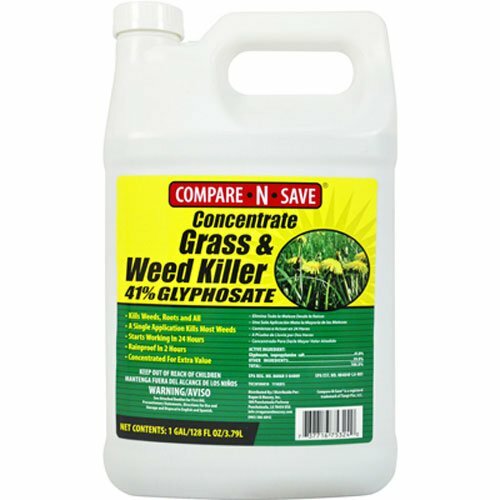 Get to the root and kill grass and weeds with Compare-N-Save 41-percent Glyphosate Concentrate Grass and Weed Killer. Use for lawn or garden replacement, on patios, walkways, or in and around fences and gardens to remove unwanted grass and weeds. The 2.5 gal. container will treat over 630,000 sq. ft. with visible results in as little as 2 to 4 days. Kills all grass and weeds. If you have any questions about this product by Compare-N-Save, contact us by completing and submitting the form below. If you are looking for a specif part number, please include it with your message.